Montana-based startup joins UET and Primus Power in raising funds for long-duration energy storage. 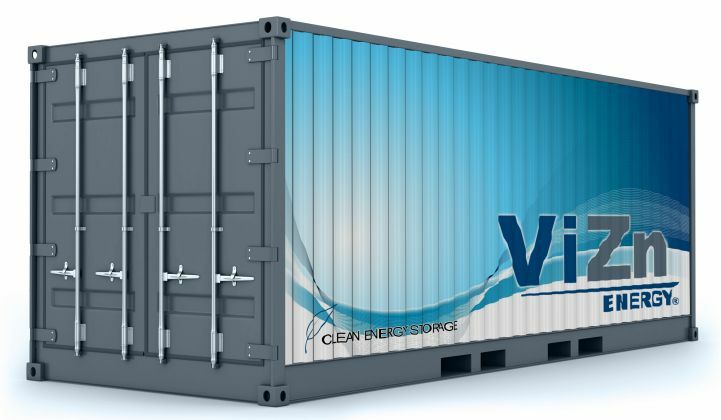 Investments are flowing in the flow battery business, with ViZn Energy Systems the latest to raise funds to scale up its zinc-based chemistry. The startup has raised another $10 million of an ongoing round of investment, according to a regulatory filing. The newly disclosed investment adds to $1.4 million added in April 2015 and $5.3 million added in October, and brings ViZn’s total funding in this round to $16.8 million of a target of $22.9 million. Back in June 2015, CEO Ron Van Dell told us the company was seeking about that amount to scale up from its then-pilot scale level of deployments. Since then, ViZn has landed a 2-megawatt order with Hecate Energy for a storage project in the territory of Canadian grid operator Ontario IESO, as well as establishing a contract manufacturing relationship with Jabil. 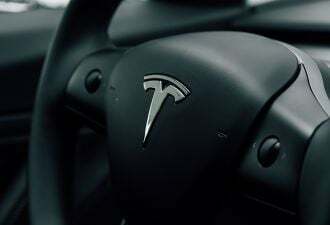 The company had raised $20 million previously from “high-net-worth individuals,” Van Dell said. ViZn’s key differentiator is its use of zinc -- a cheap and plentiful metal, but a tricky one to use in flow batteries. Specifically, it tends to gum up the electrode materials in the cells used to generate electricity in flow batteries. ViZn’s solutions, built around technology developed by Lockheed Martin, takes into account “how to do the zinc morphology, how to manage the fluid mechanics of your design, how to deal with shunt current,” the CEO said. 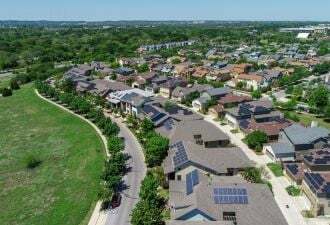 Other zinc-based flow battery makers include Australia’s Redflow Energy Storage Solutions, which is bringing a residential-sized battery to market, and U.S.-based Primus Power, which raised $25 million in September. 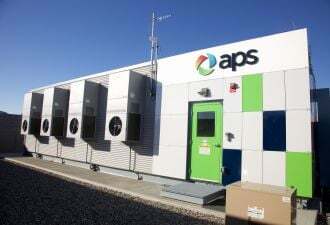 While not a flow battery, Eos Energy Storage’s zinc-aqueous batteries have landed multi-megawatt contracts with California utilities. Vanadium is the metal used by the other key class of flow battery companies. While it’s more expensive and harder to find, it offers some unique benefits -- namely, a chemical quirk that allows it to work without any additive chemicals, as required by other metal-based systems. Several generations of vanadium redox flow batteries exist. The earlier technologies are from Sumitomo, which is installing a 60-megawatt-hour system in Japan, and Gildemeister-DMG Mori Seiki, which makes the CellCube system now being deployed in Europe and in New York City. The newer-generation technologies make use of advanced vanadium electrolytes developed in part through Department of Energy-funded research, and are made by companies such as Imergy and UET. Flow batteries share the common characteristic of de-linking power from energy in the storage equation. That is to say, they can add extra kilowatt- or megawatt-hour capacity simply by adding more tanks of electrolyte to the same system, which processes it through its electrochemical cells to generate power. That’s different than a solid, cell-based battery, where the relationship between power density and energy storage capacity has to be made beforehand, in the choice of particular lithium chemistries, for example. Lithium-ion batteries still vastly outnumber flow batteries in terms of megawatts deployed in real-world energy storage systems. They’re also being used for storage projects that require up to 4 hours of discharge at a time, although that’s considered a pretty rough duty cycle for batteries. But flow battery boosters say they’re more cost-effective for 4-hour cycling and beyond, considering the potential for lithium-ion batteries doing such duty to require earlier-than-expected replacement. As with so many questions for the energy storage industry, only time will tell.